When it comes to selling a private island, standing out from the crowd is a definite plus – an exciting online auction is certainly one way to generate press. Between November 5th and 8th, the Fisher Auction Company will be accepting bids on Brown’s Island in Jacksonville, Florida’s Greenfield Creek, a 5+ acre property found next door to multi-million dollar waterfront homes. The auction house says the island is ideally suited for a weekend getaway, offering a plethora of opportunities for nature-watching, boating, and relaxation. Brown’s Island is currently undeveloped, but the island was previously approved for permits for a septic system and well. According to Fisher Auction Co. CEO Lamar Fisher, the property offers an excellent value for the money. “This island is unique in that it has a modest $50,000 minimum bid price, yet it is adjacent to vacant half-acre marsh-front lots in the Queens Harbor Development which can command up to 1 million dollars per lot,” he said in recent news release. The buildable land area on the island is fairly small, at less than an acre, but the owner suggests that there may be a way to fill in its 4+ acres of marsh. Included in the auction, free of charge, is all or a portion of the 70+ acres of wetlands (above the mean water line) that surround Brown’s Island. The recent press release suggests possible uses for the extra land. 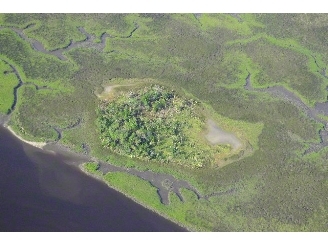 “These marshlands could be instrumental in the negotiations for filling of either the wetlands on Brown’s Island and/or possibly as mitigation for filling other valuable commercial or private property containing wetlands within the Jacksonville, Florida area,” said the release. For the Fischer Auction Company, the online auction of Brown’s Island is an exciting opportunity, although not a unique one – the company has sold two other islands via an internet auction in the last few months. As with most other real estate auctions, all bidders for Brown’s Island must be pre-qualified to ensure the auction progresses smoothly and fairly, and the highest bid above $50,000 will take home the prize. All bidder requirements, qualifying information and due diligence materials are available on the company’s website, www.fischerauction.com.